"The South: Where love, family and tradition are the sugar in our tea"
Recently, our very own design assistant ventured south for a summer family retreat. 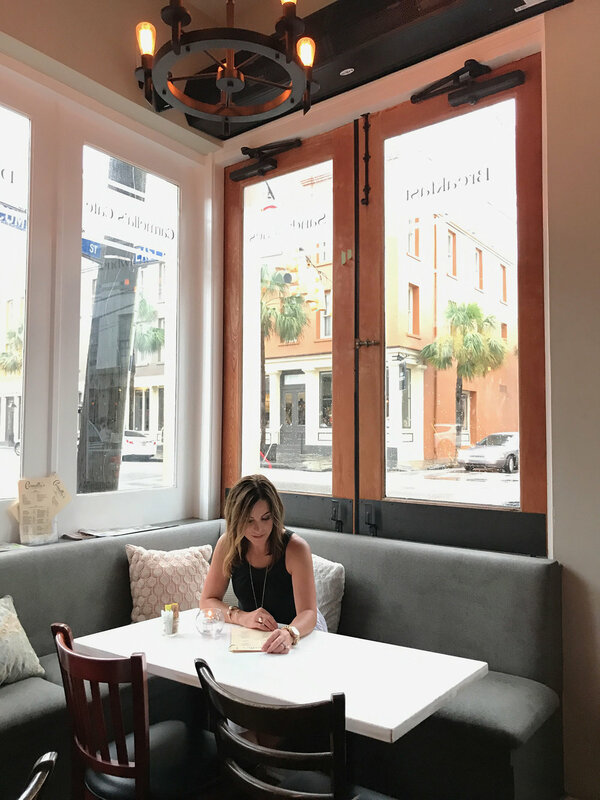 Amidst all that Charleston offers, she discovered some delightful interior gems. Charleston is well known for it's history and architecture. Staying in the Historic District has it's obvious appeal, along with the laid back locale of it's vast beaches. However, The Beach Club Charleston on the marina, is a luxurious and stylish alternative. A perfect location between excursions, having dramatic marina sunset views that draw you in and make you feel relaxed and pampered. Here are some highlights from this "Southern Charmer". Walking into the grand entrance, is like walking into an immaculate showroom, that looks out over a beautiful pool covered in palms. From the light fixtures, to the trimmings these interiors exude a delightful "Custom and Coastal" decor. The definition of southern hospitality, including the cheerful doorman... I mean, who wouldn't want the door opened for them with a warm welcome upon arrival everyday. This upscale decor flows into the lobby guest bathrooms, showcasing a clean coastal palette. With mosaic inlaid marble floors, glowing jewel-like blue sconces and enchanting blue stone vanity counters. 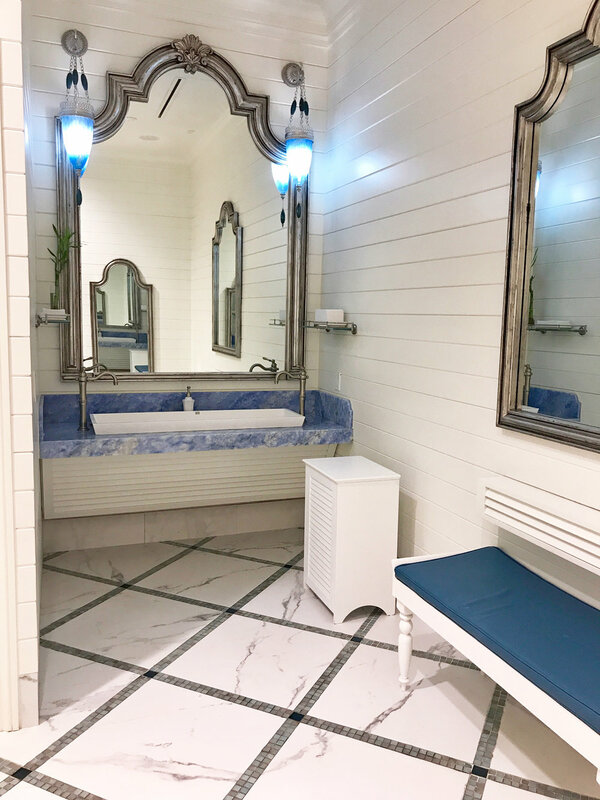 Giving you the feeling of a palacial retreat, when entering the powder room. 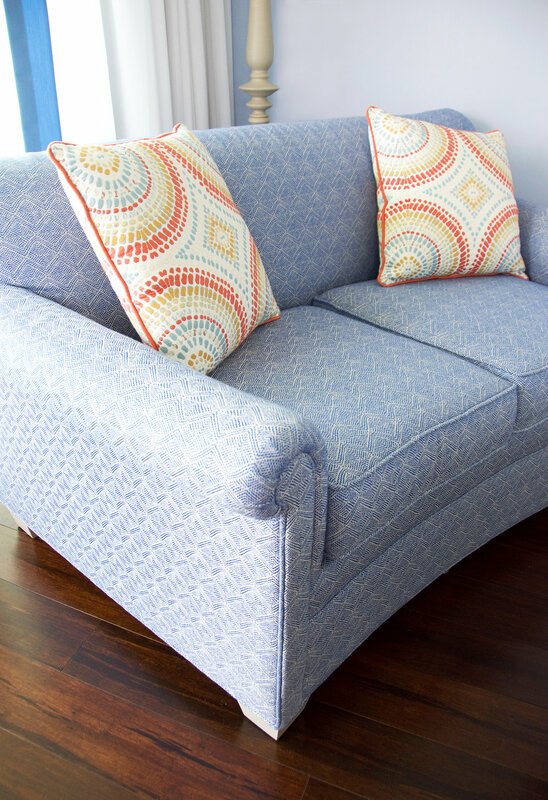 The nautical inspired theme, custom covered pillows and furniture show great attention to detail. Large bedroom suites painted with colorful pastels in soft turquoise and blues welcome you to "stay a while". The individual butler doorbells to every room are quite a thrill too. If you have the opportunity to visit the south, you will be well taken care of while staying at The Beach Club. 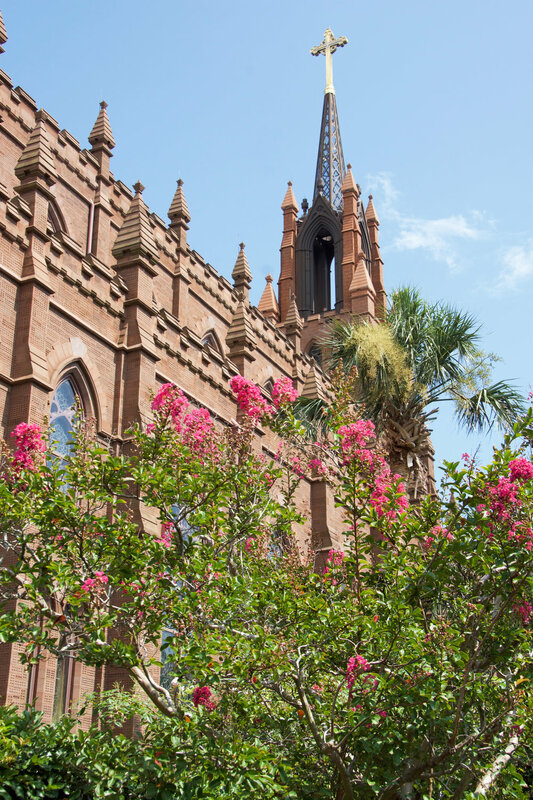 Additionally worthy excursions in and around Charleston include a tour of the USS Yorktown Aircraft Carrier, or short drive to one of the local beaches in Isles of Palms and Folly Beach. Taking a water taxi over to the mesmerizing South Carolina Aquarium that has an incredible gift shop - filled with nautical home decor, kitchen accents, jewelry and toys for the little sea creatures. A definite must is a carriage ride down through the Charleston Peninsula. Learning about the history, traveling through the market and historic district to see colorful architecture, numerable churches, stucco facades and stone walkways around every corner. Visiting the well known Pinneapple Fountain on a stroll down Queen Street to have dinner at Poogan's Porch or Husk and getting coffee at Carmella's Dessert Bar. The perfect ending to visiting this special lowcountry city, filled with eye catching splendor. Cheers to happy summer travels, in beautiful places!